American aviator , one of the world's most celebrated aviators, who was the first woman to fly alone across the Atlantic Ocean. As attributed, without source, on 'The Official Amelia Earhart' website (www.ameliaearhart.com). The first three words are also seen attributed to Aesop and to Aristotle, but Webmaster will not believe those until there is an original source seen to back them up. Life exacts for granting peace. From poem 'Courage' (1927), opening lines, included in magazine article by Marion Perkins, 'Who Is Amelia Earhart? ', Survey(1 July 1928), 60. Quoted as epigraph, and cited in Mary S. Lovell, The Sound of Wings: The Life of Amelia Earhart (1989), ix. In soloing—as in other activities—it is far easier to start something than it is to finish it. Almost every beginner hops off with a whoop of joy, though he is likely to end his flight with something akin to the D.T.’s. In 20 Hrs., 40 Min. (1928), 55. Now and then women should do for themselves what men have already done—and occasionally what men have not done—thereby establishing themselves as persons, and perhaps encouraging other women toward greater independence of thought and action. Some such consideration was a contributing reason for my wanting to do what I so much wanted to do. In Amelia Earhart and George Palmer Putnam (ed. ), Last Flight (1937), 74. In 20 Hrs., 40 Min. (1928), 310. Although this quote appears in circulation attributed to Earhart, it is usually without a source cited, for example in Karen Weekes, Women Know Everything! : 3,241 Quips, Quotes, and Brilliant Remarks (2007), 10. However, Webmaster has not yet found a primary print source. (If you know one, please contact the webmaster). The quote is also found attributed to Toni Cade Bambara (1939-1995), for example, from 'In Search of the Mother Tongue: An Interview with Toni Cade Bambara', First World Journal (Fall 1980) quoted in Moraga and Anzaldua, This Bridge Called My Back, viii. Cited in Wendy Farley, Eros For The Other (1996), 148, as a reply when asked if fiction were the most effective way of 'unit[ing] our wrath, vision, our powers.' However, note that Bambara was born two years after Earhart's airplane was lost (1937). 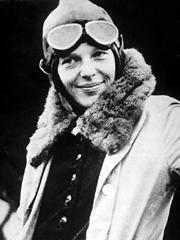 24 Jul - short biography, births, deaths and events on date of Earhart's birth.